Okay, confession time, I am obsessed with Offspring*. Admit it, you are, too. The humour. The drama. The romance. The all-too-familiar overactive imagination. Definitely my favourite Wednesday night activity. Now that another season has come to a brilliant conclusion, I find myself lingering on the webpage hoping to discover a 'hidden' episode I missed. Alas, I've seen the entire season, so instead I'm putting my obsession to good use and am making Nina Proudman's the next style that I create sustainably. Nina's wardrobe staples are layers, tall boots with a heel, denim, maxis and interesting accessories. And if you've ever found yourself wondering 'where can I buy Nina's [fill in the blank fashion item]? ', you're not alone. There is a cult-following of Nina Proudman's wardrobe, and I'm definitely on the slow boat of fashion bloggers describing how to emulate her boho-luxe style, most notably a fab 14-part series by Styling You. Here I will show you how to recreate her feminine, playful, effortless-with-amazing-details, style, sustainably. As a starting point, shop your own closet. 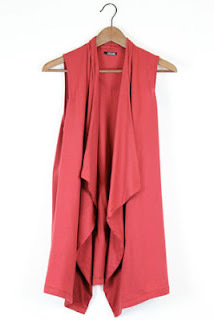 Have a look for pieces that you may not have worn together before, and mix them together to make a fabulous "new" outfit. Nina regularly does this - so three cheers for Offspring's wardrobe department. Not only does this make her character feel more realistic, it's much more sustainable than buying new pieces for each episode. Many pieces in Nina's wardrobe are quite unique, with beautiful detailing, frequently found in smaller labels, and it's a great opportunity to support local designers. NancyBird, a Melbourne accessories label with a great sustainability ethos, is regularly featured on the show (another three cheers for the wardrobe department!). 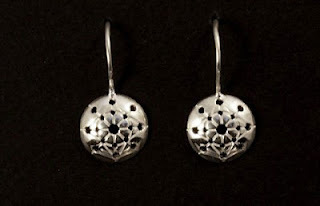 Here are a couple beautiful 'Nina-like' pieces from their current collection. 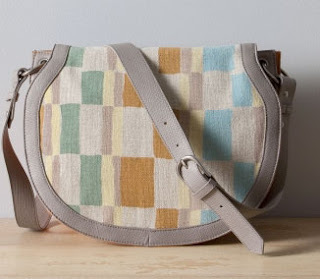 Millie bag includes lovely detailing in the square fabricl. this colour and pattern would look stunning on her. Left: Nudie is now using 100% organic cotton - eco-fashionistas rejoice! 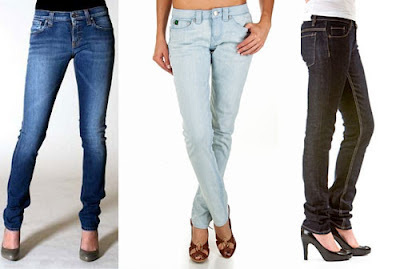 Centre: Reborn jeans by REUSE, using 80% recycled cotton. and can attest to the 'my-bum-looks-great' quality firsthand. 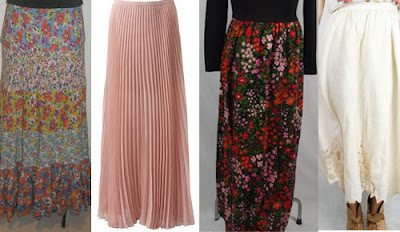 Nina's wardrobe is packed full of feminine maxi skirts, which lend themselves so easily to sustainable styling . Anyone else thinking vintage and reuse? I found each of the below options on eBay. My favourite thing about Nina's wardrobe is her love of layers - to me it's quintessential Australian-style, and she wears such interesting colour and textural combinations. Here are a few pieces to get your layers started sustainably. 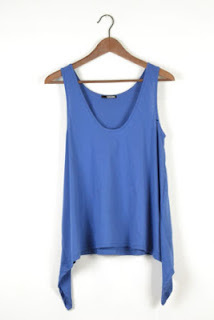 vibrant Arctic Blue organic tank from Sosume. by Sosume - made of organic cotton and wool. A quick online search found these 3 vintage tops - I especially love the pale blue sequins! it untucked with jeans, and maybe a button or two undone. 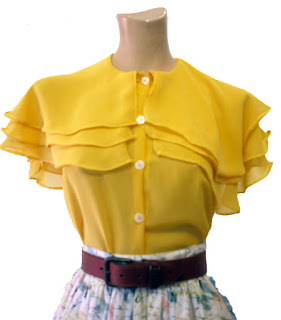 This blouse is made of vintage fabric, by Ra Ra Superstar. 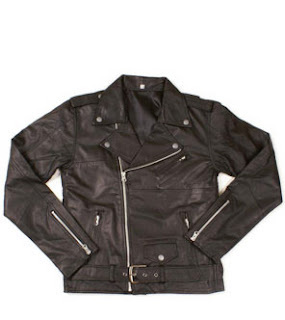 How great is this biker jacket made of upcycled vintage leather? HOT! Get it at Fashioning Change. 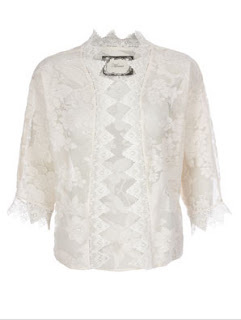 And I LOVE this cardigan made of vintage lace. I reckon Nina would, too. Another Fashioning Change find. Nina sports plenty of playful jewelry - there are so many amazing sustainable jewelers at the moment making beautiful, quirky and unique pieces, and I've just pulled out a couple below. 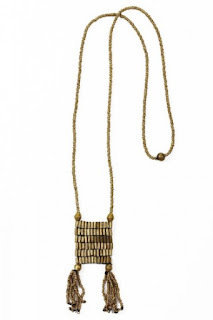 in Ethiopia - a gorgeous piece that makes a difference. 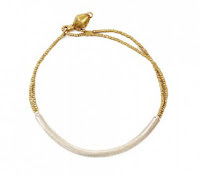 sales go to health and literacy programs in Ethopia. These earrings on AndAble just look like they belong on Nina's ears. a micro-financing organisation helping women help themselves out of poverty. I've really just scratched the surface here. For every item I've shown above, I had multiple others that didn't make the final cut. It was easier than even I imagined to pull together Nina's wardrobe sustainably, and I'm the eternal optimist. So, if you want to recreate Nina's style, sustainably, happy shopping! I'd love to see any great pieces you come across. *My American readers, you probably haven't seen Offspring, and you don't know what you're missing! I suggest you go to iTunes right now, download Seasons 1, 2 and 3, and start watching immediately. You can thank me later. Though it's not typically my personal style, I had to chuckle to myself today as I was clearly channeling Nina Proudman. I really should have worn a long thin scarf or necklace, and a lighter shade on top to do it properly, but it's obvious I really got into my research this week! Long-sleeve top made of eco-wonder fabric micro-modal. And on a side note, I this is probably my last post from Oz for awhile. I leave next week on my grand adventure. I look forward to bringing you the latest eco-news from around the globe!